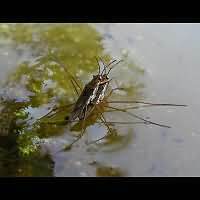 The Common Pond Skater is a quite common bug as well. 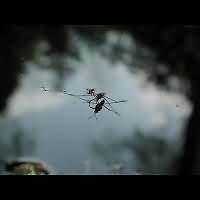 They are light and have long legs which are adapted for walking on the surface of the water. They skate with 2 pairs of legs only. The front legs are used to take any pray that accidentally lands on water. Some adults do have full wings, but in most cases the wings are underdeveloped. Only those with fully developed wings can fly. By the way: the identification is tentative, for within the genus of Gerris are a few very similar species. There are however reasons to believe this is the Common Pond Skater indeed. By the way: there are a few other water bugs. They do not live upon the water, but in it. Best known are probably the Water Boatman and the Water Scorpion. 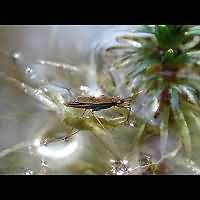 This species is also known as the Water Strider.